Bridie Jackson introduces her passion for crystals and gemstones of all kinds, their uses and how you can get the most out of them. Find a quiet space, Turn off the lights and any electrical appliances (including the phone!). Light a candle to focus your attention, play some calming music. Hold the crystal in your left hand pointing in (or your right hand if you are left handed and it feels more comfortable); focus on your breathing, keep it slow and gentle but natural. Release your tension with the out breath, draw in the crystal energies with your in breath. Everything you see, feel, hear, taste and smell is important. Observe and recall the experiences so you can think about them afterwards (writing down your recollections right away is very helpful). Our energy bodies are very open after using crystals, so when you are ready to finish, circle around yourself with your control quartz (one that you identify with strongly) asking to be "closed, sealed and protected." Thank and cleanse your crystal. Silicon dioxide is the most common mineral on the face of the earth and included within the quartz family are amethyst, citrine, rock quartz, and the smoky and rose varieties. 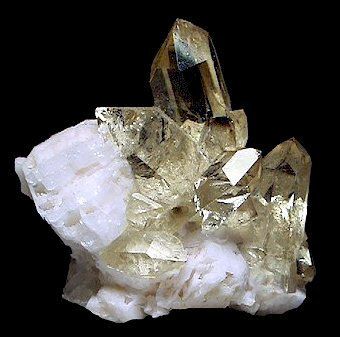 Quartz, known as the Master Healer, is one of the few crystals to works on every level of our being. It contains properties of piezoelectricity and pyroelectricity, and is activated when heat or pressure is applied. They emit these electric properties when held, amplifying the intent and focus of the holder. Using intent of the Highest Good is essential when using crystals for this very reason. Clear quartz contains "white light", the full rainbow of colour rays and energies. Passing sunlight through the crystal will make a rainbow appear in the shadows in front of the crystal. Since it vibrates at all frequencies it works on all levels; mental, spiritual, emotional and physical. It also works on all the chakras. Clear quartz is unique in being able to vibrate at a chosen frequency, for example if you hold the intention of love energy, this will be amplified by the quartz and then produced via the point. This is known as programming. hold your crystal at your heart chakra and fill the quartz with the intention for your desired energy. Always remain clear and positive when programming so as not to affect the energy with negativity. Quartz energy is magnetically drawn to blockages or lower vibrations. It can help to improve the movement of energies between the chakras and activates the kundalini, the energy that travels through the chakras, up the spine out of the crown chakra bringing a connection with the universe. Quartz brings clarity and light to situations, making for positive change. Used within the home it can clear radioactive and static energy. Wearing quartz will activate the chakra nearest to it.